The Customer Thank You letter is used to send to a customer to express your thanks for their business. Proposal Kit Pro, downloaded it immediately and had a contract with all attachments ready! The contract was great and it had a lot of clauses in it that I would have never thought of. I would definitely recommend Proposal Kit to anyone in need of contracts." This Customer Thank You Letter is included in editable Word format that can be customized in Word or by using the included Wizard software. At Company Name, we value our customers. We'd like to take this opportunity to thank you for doing business with us. Insert any additional details you'd like to include. Many companies attach coupons or special offers to Thank You letters. News of a change in the organization, such as a change of name or address, or new merchandise or services, can also be included. Use formal address, such as "Dear Mr. Smith," if you do not have a personal relationship with the customer. If you are on a first name basis, use the familiar address, such as "Dear Susan. 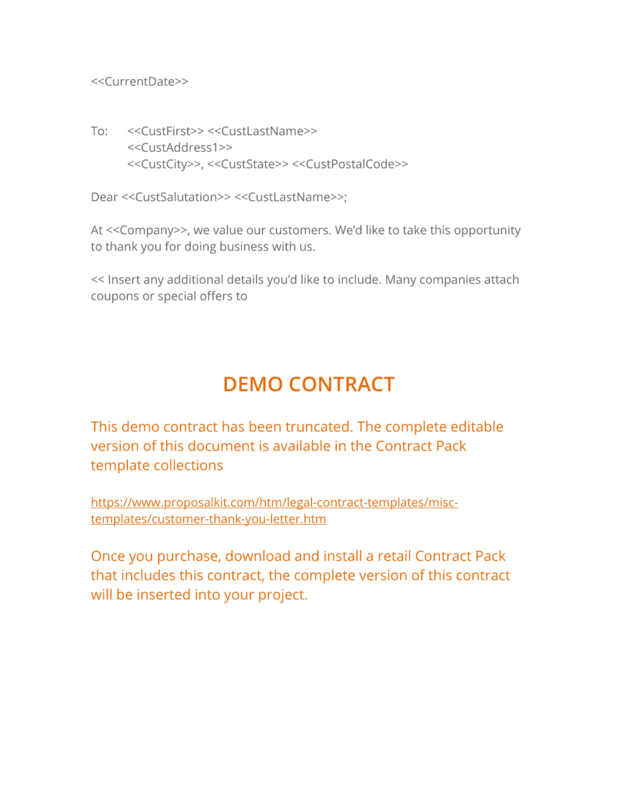 The complete Customer Thank You Letter - with the actual formatting and layout - is available in this Contract Pack.